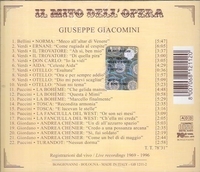 “Giuseppe Giacomini is a brilliant tenor, and to my taste the greatest of all the dramatic tenors. (Let me say only that I do not consider the nonpareil Franco Corelli a dramatic tenor.) The power, the richness, the ring; it's positively thrilling. He sounds almost like Leonard Warren with a tenor range. Absolutely unbelievable, and the style and musicianship are impeccable, as they always are with Giacomini, an intellectual and very well educated musician. Giuseppe Giacomini is possibly an epicure's taste in the somewhat giddy and show business obsessed world of American opera during the last 30 years. He was not nearly as popular here, sadly, as those tenors who obsessively and instinctively played to the gallery. He was and remains a very strong-minded man; a serious musician with absolutely no time for silliness or show business glitz. He was not a beautiful heart-throb like great Franco Corelli; he was plain: short, half bald, and very near-sighted. He appeared in concert looking exactly like he really does, often right down to the coke-bottle-lens glasses. He was there to sing, not to compete in a glamour contest.